NEW YORK (CNNMoney) -- Investors had no place to hide on Thursday, as stocks and commodities cratered throughout the trading day. All three indexes closed down more than 3%, clocking the worst percentage losses since August 18, 2011. 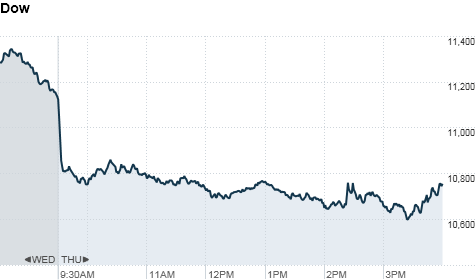 At one point in late-afternoon trading, the Dow had plunged more than 500 points. 10-year Treasuries appeared to be among the only safe haven in the perilous global market. Investors piled into 10-year notes, which pushed the yield down to several new record lows throughout the day. Investors also remain jittery over the fate of Europe. "There's still a lot of fear that September 2011 is going to be a lot like September 2008," said Paul Larson, chief equity strategist at Morningstar. "Greece is going to play the role of Lehman Brothers." The market's fear gauge, the VIX (VIX), spiked 17% to 43.65. Any reading above 30 signals investor worry. The Dow Jones industrial average (INDU) closed down 391 points, or 3.5%. It's down 7% in 2011. Shares of United Technologies (UTX, Fortune 500), Alcoa (AA, Fortune 500) and Caterpillar (CAT, Fortune 500) lost the most ground. The S&P 500 (SPX) lost 37 points, or 3.2%, with only six of its components showing gains. The S&P is down 7% for the year. The Nasdaq Composite (COMP) dropped 82.5 points, or 3.3%, and more than 10% for the year. The Dow is on track for its worst weekly performance since September 2008: It's down 6.74% over the past four days. Still, the S&P 500 narrowly avoided closing below 1,120, a significant technical level that would have made tomorrow's opening as negative as today, said Samuel Ginzburg, a senior trader at First New York Securities. "That number is absolutely crucial in our opinion," he said. "The only thing that goes up in a down market is correlation. This is why you're seeing energy, stocks and other commodities all drop," said Bryce James, a portfolio manager at Aston-Dynamic Allocation Fund. Financial stocks were among the most bruised sectors Thursday, as rumors swirled on trading floors about Morgan Stanley (MS, Fortune 500)'s and Citigroup (C, Fortune 500)'s exposure to Greek sovereign debt. Morgan Stanley's and Citigroup's shares fell 6.8% and 7.9%, respectively. Moody's downgraded Bank of America (BAC, Fortune 500), Citigroup (C, Fortune 500) and Wells Fargo (WFC, Fortune 500) on Wednesday, adding further pressure to the sector. The selling started early, with world markets logging steep declines. Investors globally sold out of stocks as weak manufacturing data from China sparked fears of a slowdown there. "There was a lot of concern over China because heretofore it's been the one pocket of unstoppable strength in the global economy," said Larson. "If that stops and China becomes a drag on worldwide growth, it could have big implications here in the U.S."
U.S. stocks also ended sharply lower Wednesday, after the Fed said it will shift $400 billion from short-term Treasuries into long-term Treasuries in an effort to boost lending and spur the economy. While the so-called Operation Twist was what investors had been anticipating, it wasn't enough to just meet expectations. "Once the Fed made the announcement, the anticipation was gone, and people began to look at a deeper level what it means when the Fed doesn't have any monetary tools to make a big difference in the economy," said Steve Rogers, a portfolio manager at California Investment Trust. As investors fled the global stock markets they rushed for safer havens, driving up the price on the benchmark 10-year U.S. Treasury. That pushed the yield down to a fresh record low of 1.695% from 1.88% late Wednesday. The dollar moved higher against the euro and the British pound, but was slightly lower versus the Japanese yen. Economy: The Fed's latest assessment of the economy spooked investors. Though the central bank has been warning of slower growth for months, its signal of "significant downside risks to the economic outlook, including strains in global financial markets" added to the pessimistic forecast. A preliminary reading on China's manufacturing activity fell in September, according to HSBC's survey, renewing concerns about a sudden slowdown in the world's second-largest economy. A separate report showed that manufacturing in the eurozone contracted for the first time in over two years, according to London-based Markit Economics. The reading "provides the strongest sign yet that the region is on the cusp of recession," said Capital Economics European economist Ben May in a research note. Meanwhile, the U.S. Labor Department issued its weekly jobless claims data ahead of the opening bell. The number of unemployed filing for first time benefits in the latest week fell from the prior week but still came in at a higher-than-expected 423,000. The Conference Board's index of leading economic indicators rose 0.3% in August, higher than expected, after having climbed 0.5% in July. World markets: European stocks all closed down. Britain's FTSE 100 (UKX) lost 4.7%, while France's CAC 40 (CAC40) fell 5.3% and the DAX (DAX) in Germany dropped 5%. Asian markets ended sharply lower. The Shanghai Composite (SHCOMP) finished 2.8% lower, the Hang Seng (HSI) in Hong Kong plunged 4.9% and Japan's Nikkei (N225) fell 2.1%. Companies: Shares of Goodrich (GR, Fortune 500) spiked after United Technologies (UTX, Fortune 500) agreed to buy the aircraft parts maker for $16.5 billion. Shares of Hewlett-Packard (HPQ, Fortune 500) fell as investors anticipated a management shakeup. HP's shares soared almost 7% Wednesday on news that the company's board was considering replacing current CEO Leo Apotheker after barely a year on the job with former eBay boss Meg Whitman. The board finally pulled the trigger on that management change shortly after the market closed on Thursday. FedEx (FDX, Fortune 500) shares slid after the company lowered its guidance when it reported quarterly results Thursday. The package delivery company cited the slowing global economy and higher fuel prices. Nike (NKE, Fortune 500) will report results after the close. Big bank bailouts less likely. Thanks Dodd-Frank!